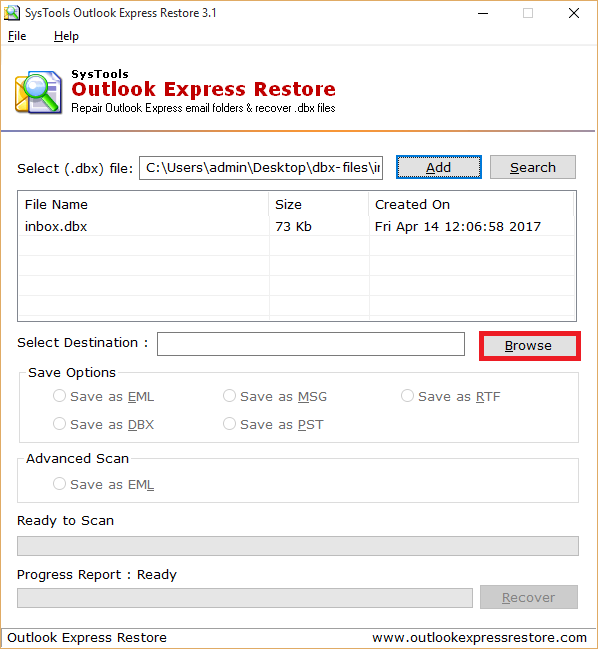 Outlook Express Recovery restores corrupt mailbox data which includes different folders like Inbox.dbx, Folder.dbx, Sent.dbx. 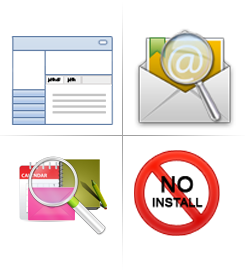 The tool also features multiple formats to restore Outlook Express emails. Users can export repaired DBX files to required email formats and export into other email clients. 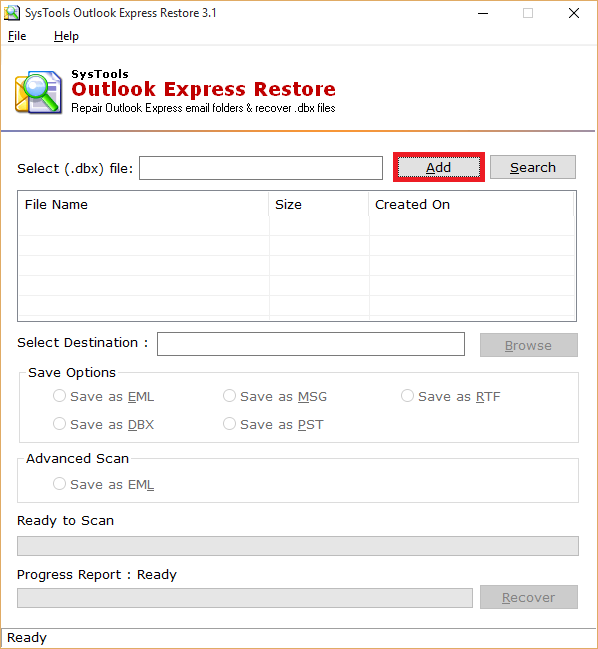 Users can also restore emails from Outlook Express DBX files. This tool also provides multiple file saving options to choose from. Moreover, users can store files in different file formats like MSG, EML, PST, RTF, and in DBX format after proper scanning and recovery of corrupted DBX files. DBX recovery software maintains original formatting of Outlook Express DBX files. All meta properties associated with emails remains unchanged. Moreover, attachments of DBX files are in original format or intact. No single change is made in the saved information. This tool is also flexible with the Windows Operating system 10 and below versions. If DBX files are highly corrupted then instead of opting normal DBX recovery, we would recommend the users to choose Advance scanning mode to restore emails. This helps the users to perform in-depth scanning of the file to repair DBX files. Moreover, users can save the file to any other formats featured by the tool. The search option is helpful when users have multiple DBX files. This option enables the users to choose the folder containing various DBX files and it will lists all the files together with the item count. Afterward, selective DBX files can be added from the list and recovered altogether. When you search or add DBX files, this Outlook Express Recovery software shows the associated details on its preview panel. You can view the name of each DBX file being addressed, size in KB, file creation date, day, month, year and time also. The Outlook becomes quite unstable as the .dbx file size grows and that typically happens when the file size exceeds greater than 2 GB in size. So you are left with few options either archive the old messages or perform .dbx file compaction. But over time people have started noticing that compaction leads to .dbx file corruption and in absence of a good backup, there is not the user can do much as the corrupt file is nothing but random zeroes and ones. When you face this type of problem one of the main causes is the corrupted Inbox.dbx file and so in order to correct the issue you need to rebuild the files such as Folder.dbx or Inbox.dbx files which you can do either by replacing it with the previous backup of it or by performing the recovery of DBX files using the Outlook Express Recovery tool. The issue might not get resolved unless all other corrupted files and folder are taken care of including your mailbox, sent/receive folder your outgoing folder etc. How to recover your Outlook Express DBX Files/Emails when you faced with corruption? Save the backup to some safe drive. Download the DBX recovery software & provides the path of the folder that you just have taken backup of, provide the format that you want to restore .dbx emails and start the scanning process. The scanning process may take a while so you can relax in between. Replace this DBX file with your original file and you will have your Outlook Express email client back to normal. Demo version of DBX Recovery Software will Only Generate Preview & Export only 15 Recovered Items per Folder in DBX, PST, EML, MSG, RTF. How DBX Recovery tool repair corrupt DBX files? What might have caused corrupt identity in Outlook Express? One possible reason that can be attributed for the corrupt identity is that some files or folder (e.g. Folder.dbx, inbox.dbx etc.) got corrupt. 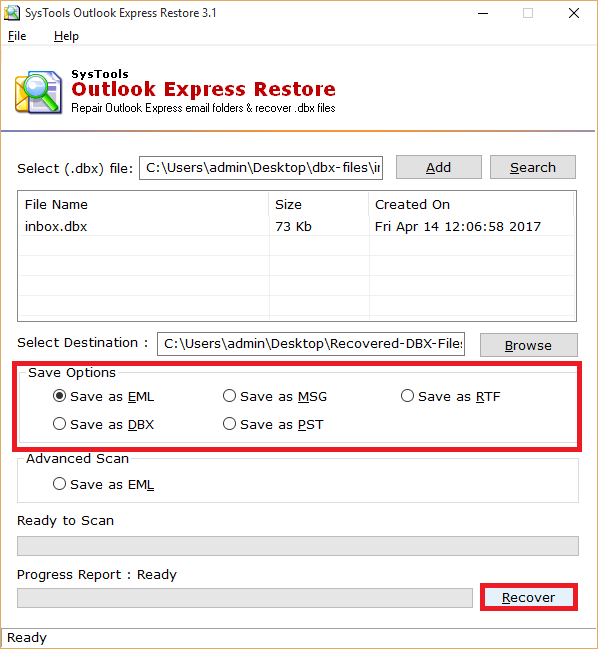 Try repairing the .dbx file with the Outlook Express DBX Recovery Tool and the issue will be resolved. Each and every time I start Outlook Express it hangs? What's the possible reason? What we have seen the major reason for this is the corruption in Inbox.dbx file. Please use the DBX Recovery Software to bring it out of corruption and in the healthy state after that, the OE software will stop freezing. Can I repair corrupted Outlook Express DBX files? Yes, by using this DBX Recovery Tool you can restore corrupt DBX file into another format. Moreover, you can add multiple DBX files and repair them at a time. Does Outlook Express Recovery Software run on my Windows 10 OS? Yes, you can install and run the DBX Recovery Software on a Windows 10 OS and all earlier version of Windows Operating system. Outlook Express email Recovery tool does not need installation of Microsoft Outlook Express on the conversion system to retrieve DBX files. Would I recover completely damaged DBX files by using Outlook Express Recovery tool? Yes, this DBX Recovery tool provides Advance scan option to repair completely damaged or corrupted DBX files. If data is not recovered by normal scanning users can choose “Advance Scan” option as it scans each bad sector of the file. 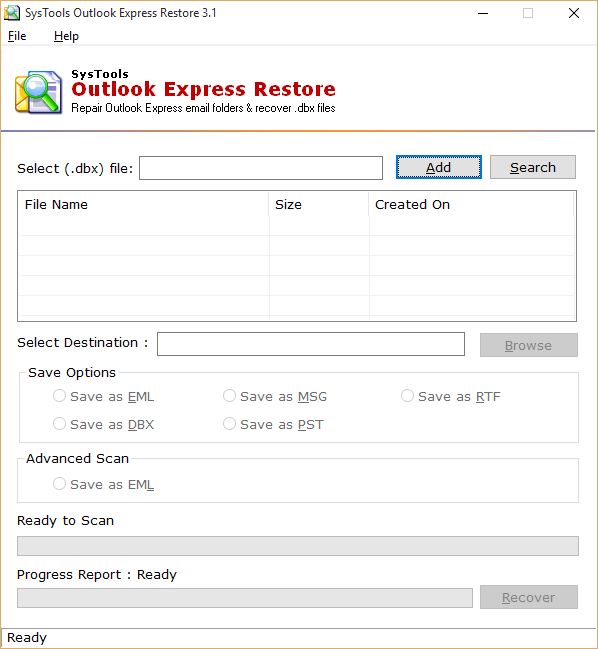 Can I repair damaged Outlook Express 4.0 version DBX files? Yes, you can restore emails from damaged DBX files from Outlook Express 4.0 version. DBX Recovery Tool supports all versions of Outlook Express such as Outlook Express 4.0, 5.0, 5.01, 5.5 and 6.0. Just add any versions DBX files and recovered. What is the largest size limit of DBX Files and how much time required to retrieve DBX files? There is no file size limitation by DBX Recovery tool. You can repair DBX files of any size. However, the time required to retrieve DBX file depends upon the level of corruption in DBX file. Large sized and highly corrupted DBX file takes more time to recover. What is the converted file format of Output file ANSI or UNICODE? By default, DBX Recovery software creates PST file of UNICODE format after restoring Outlook Express data. Furthermore, it also depends on the version of Outlook installed on the machine. Outlook Express just stopped working when the OE prompted for .dbx compaction and I tried everything to bring it back to normal but all efforts where futile. This DBX Recovery Tool not only helped me regain my important emails but I don't have to rely on OE anymore as the tool also supports OE migration as well. Now I am planning to move to Outlook platform using your software. 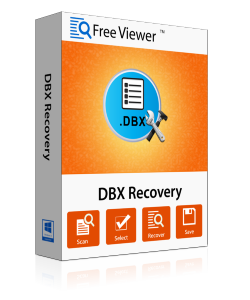 So simple and easy to use and prior to using your Outlook Express Recovery tool, I thought I lost all my emails but when I used your FreeViewer DBX Recovery Software I instantly got them back. You can't imagine my relief as those emails were very crucial to me and I cannot afford to lose them. Now they are working fine and I also started keeping a backup to secure my emails. DBX Recovery tool works great as it provides the facility to repair corrupt DBX files and restore them in different file format. I can easily restore the data in PST file format without any hassle. Thanks, FreeViewer this is the very helpful utility. I have tried many software’s to repair DBX files. But, I was still not satisfied as I was looking for a software that provides the complete package of effectiveness and great ease of simplicity. But, this Outlook Express Recovery tool delivers all.